Even as he congratulated AR Rahman, Resul Pookutty and Gulzar for their Oscar win, a disturbed Amitabh Bachchan has lashed out against "untruthful" reports saying actress Kareena Kapoor had "snubbed him", by not "giving him a look or greeting him". He wrote from Hyderabad, "I learn of the great achievements of our Indian technicians and music directors at the Oscars. My warmest and heartiest congratulations to AR Rahman and Resul for winning recognition in music and sound and to Gulzar for co-assisting Rahman in the lyric category. International recognition for Indian film talent on one of the most well-known and popular forums is the happiest day for Indians and the industry. The journey of Indian Cinema has been phenomenal. May it grow even bigger and greater." Putting the record straight on the Kareena issue, the superstar blogged, "Kareena and all other members of her family and ours have always given due respect to each other, irrespective of what the circumstances may have been, or what circumstances the media keeps harping on in most nauseating fashion. She is a warm and affectionate person and has never ever given reason for us to feel otherwise." Kareena's sister Karisma was engaged to Abhishek Bachchan at one point. The end of the relationship was said to have created a rift between the two families. 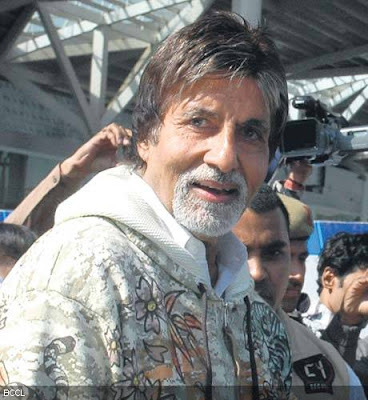 Bachchan added, "Kareena has grown up in front of me. Our families have known each other, with respect, from the time of her great-grandfather, the most respected Prithvi Raj Kapoor, father of Shri Raj Kapoor who is the father of Randhir Kapoor, her father. Randhir Kapoor's sister's son Nikhil Nanda is married to my daughter Shweta. We are therefore 'samdhis', belonging to one family as per our tradition and culture. Kareena's grandmother, the dignified and loved Krishnaji, wife of Raj Kapoor and mother to Randhir is looked upon by all of us as the eldest living member of the family." Walking down memory lane, he recalled, "Prithvi Raj Kapoor, the great theatre and film personality and legend and the founder member of the Kapoor dynasty in Indian cinema, was a great admirer of my father. There have been many childhood memories of Allahabad, where I was born and brought up, when Prithi Rajji would come over to our house and spend time with his theater group, Prithvi Theaters and my father." After advising the media to exercise restraint, the actor signed off "with love and without malice"!